I had the pleasure of testing the Helios Rapide 8×25 monocular this week. Aimed at the budget end of the market, but as you will see in this review it is anything but budget quality. 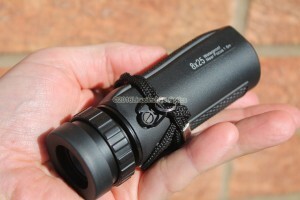 The outer packaging is a colourful and sturdy design, showing a good image of the monocular and the full specs. The case is a standard soft nylon one with a belt loop. Thankfully the cleaning cloth included is of a good standard. Sadly so many cleaning cloths with binoculars are very poor quality and wood do more harm than good. So taking the monocular out of the box, you are greeted by a very sturdy looking body with thick rubber armour and an attractive design. The eye cup is twist type, and has eye relief long enough for spectacle wearers. At first I found the focus wheel quite stiff, but this loosed up very quickly with use. Close focus is 1.6m, making it also suitable for close up work such as insects in the garden. The wide 6.7 degree field makes tracking of moving targets a breeze. Just under half a turn of the focus wheel is needed for focus from arounf 5m to infinity. This entry was posted in Monocular Reviews and tagged 8x25, helios, rapide. Bookmark the permalink.